Six year-old Teo White Wolf-Traversie has been roping since he was three years old. According to his grandmother, the Takini kindergarten student always has a rope in his hand, practicing on his roping dummy. 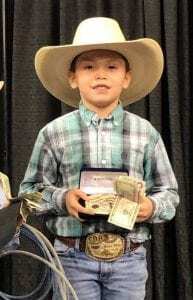 All his hard work and practice paid off this past weekend when Teo placed first in the 6 and Under category at the Annual Black Hills Stock Show in Rapid City. Not only did he compete against other ropers, he competed against time. In the timed event, competitors were given five chances to rope a dummy. The competitor with the most successful ropes and best time would win. When it was his turn, Teo confidently took center stage, griping his rope. Smoothly swinging his rope above his head, he built momentum as he created a perfect loop. At just the right moment, Teo released his rope, aiming perfectly on target. Four more times he completed this task, all while a large crowd of spectators watched, and judges scrutinized the seconds passing and Teo’s attempts. At the end of the competition, Teo bested his competitors, successfully roping the dummy five times, a perfect score. Teo placed first and was awarded a buckle and a cash prize. According to his grandmother, Kim, Teo is following in the steps of his great grandfather Sullivan White Wolf Sr., who is a well-known team roping champion and senior pro breakaway roper in SDRA, NRCA, and GPIRA. It was one of White Wolf Sr.’s champion buckles that Teo wore during the roping competition. After his win, Teo’s Uncle Dex bought him a new rope- with his new rope and shiny buckle of his own, Teo is already practicing, ready for his next challenge. Teo is the son of Ricki White Wolf and Dusty Traversie. His maternal grandmother is Kim White Wolf and his paternal grandparents are Kenny and Susie Traversie. Teo is the great grandson of Sullivan and Lillian White Wolf Sr.